1. The VECTOR is a fully integrated autopilot for use in advanced aerial target and UAV platforms where ultimate performance is required. It is suitable for all types of platform, including fixed and rotary wing UAVs; it is also suitable as the base for a flight control system of an Optionally Piloted Vehicle (OPV) or conversion of a manned aircraft into a UAV. 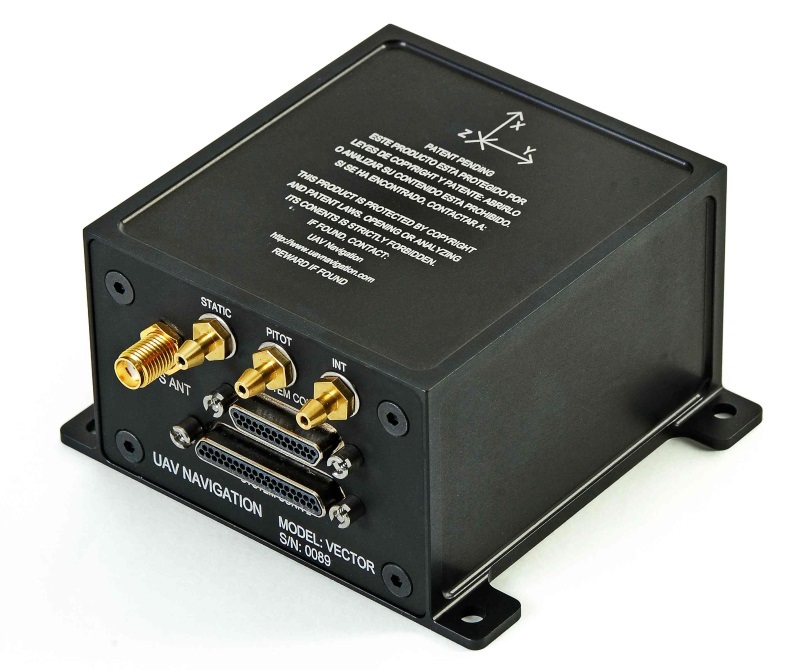 Other than servos, batteries and an external datalink (radio transceiver), the VECTOR is the only onboard system required to control a UAV and its payload. 2. Military Grade. The VECTOR was designed in accordance with MIL-STD-810F and MIL-STD-461F and passed all the relevant tests in the Spanish INTA aerospace laboratories. See brief explanation here. Full details and test reports are available on request. Aerospace grade, waterproof, anodized aluminium housing with rugged Micro-D type connectors. Twin redundant Flight Control CPUs. A fully configurable Field Programmable Gate Array (FPGA) which gives complete flexibility in configuring the autopilot for communicating with onboard avionics and peripherals. 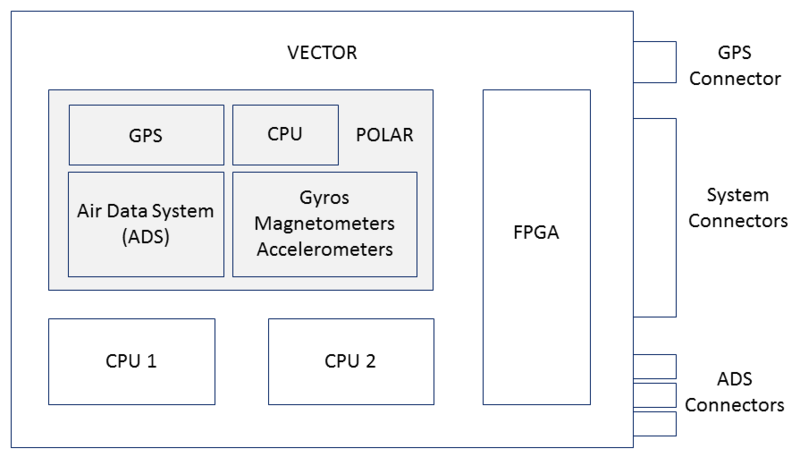 POLAR Inertial Measurement Unit (IMU), including an Air Data System* (ADS) and precision multi-constellation Global Navigation Satellite System (GNSS). The POLAR provides the heading, attitude and velocity information required by the Flight Control CPU in order to control the UAV in all flight modes and to execute the required flight plan. POLAR is available as a standalone product; for more information, see KB articles for POLAR. * For information on the different airspeed ranges covered, see KB article 'POLAR Airspeed Ranges'. 4. Real Time Operating System (RTOS). The VECTOR features an RTOS. In simple terms, the key advantage of an RTOS is its predictability and the fact that non-critical functions are never allowed to slow down more important tasks, such as flight control. This leads to a safer, more reliable system. For a more detailed introduction to RTOS, check out this article. 5. Fully Automatic Operation. The VECTOR is designed for fully automatic operation of the UAV, including auto take-off, flight plan execution and fully auto landing. For a full list of operation modes available, see separate KB article 'Basic AP Flight Modes'. VECTOR can also adapt the aircraft for each stage of flight, e.g. deploying flaps during landing, locking nose wheel steering and deploying a parachute after a controlled deceleration of the engine. Full range of alarms (see KB article 'Autopilot Alarms'). Protection against radio link loss: VECTOR can be programmed to return to base and land automatically. Survival of sensor failure: VECTOR uses advanced estimation algorithms that greatly enhance navigation accuracy and make the VECTOR capable of surviving several sensor failures, e.g. in case of loss of GPS signal, VECTOR will continue to navigate in inertial mode. VECTOR can be configured to provide redundant servo outputs (e.g. two separate ailerons on each wing). VECTOR ensures that the flight envelope of the UAV is never exceeded (e.g. no more than 2G in a turn). Manual override capability (using an R/C type joystick). 7. Peripherals. See KB article 'Introductions to Peripherals'. 8. Installation. See KB article 'Autopilot Installation'. 9. Positive Internal Pressure Port (INT). In addition to the static and dynamic pressure ports for the Air Data System, the VECTOR features a port for internal pressurization. This is used to connect to a positive external air pressure supply in order to enable component protection at very high altitudes, and also greater survivability if submerged in water.